[ M]y short time at Outlandia was a privilege and I was bowled over by the beauty. Outlandia is patient, kind, vigilant and harmonious. I had an intensely rewarding day. It is a place with a future Packing with a headache in spitting rain was a challenge. My mini-sled took an age to pack. I discarded almost all essential items, finding space only for oatcakes, nuts, raisins, water, mint tea, audio recorder, sketch books + furry cover, black pen, cotton rug. Using my black rain jacket as a tarp against the rain, I tied the bundle onto my sled with slender guy ropes and plaited baling twine. 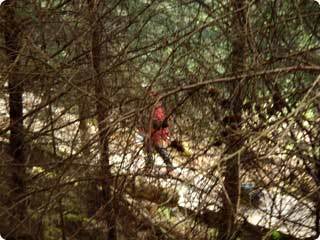 My barefoot journey to Outlandia followed The Peat Track; a path with an intimate knowledge of sleds. Helped by gravity the ancient clods must have descended Cow Hill on sleds to be used as fuel in the homes and workshops of the Glen. I loved walking the boardwalk over the dark hillside of larch, sitka spruce and damp moss and crossing the bridge into an interior that is dry, welcoming and alive. The forest boardwalk acts as a lure, enticing unwary travellers into the abode of Outlandia. In this way many inquisitive visitors arrive at OUTLANDIA. And so it was during my residency that a Scandanavian family arrived as I was data gathering from ancient times. I incorporated the interruption into my journey and their chatter led me along a straw path over a glacier to a group of “original people” and their reindeer. I think they influenced the outcome.